Thursday January 6th 1898 I had a good deal of extra work today, I did so much sweeping. I knit a little in the evening. The boys did good work with the ice. Friday January 7th 1898 I did baking and churning today and dressed a turkey to take to town tomorrow. They had another man to help and made a big days work with the ice and got it done. I was over to see Emma a few moments today. Saturday January 8th 1898 We hurried through the work and went to town. I got my trading done and we got over home for dinner. Did not stay long after that and came home around by the Hedges place for some thing Will wanted. Did evening work and read till bed-time. Sunday January 9th 1898 Will and I went up to Elmer Andersons soon after breakfast and did not get back till nearly eleven oclock. I got the dinner over and went over to Emmas and Callies. I read a little in the evening. weather pleasant. 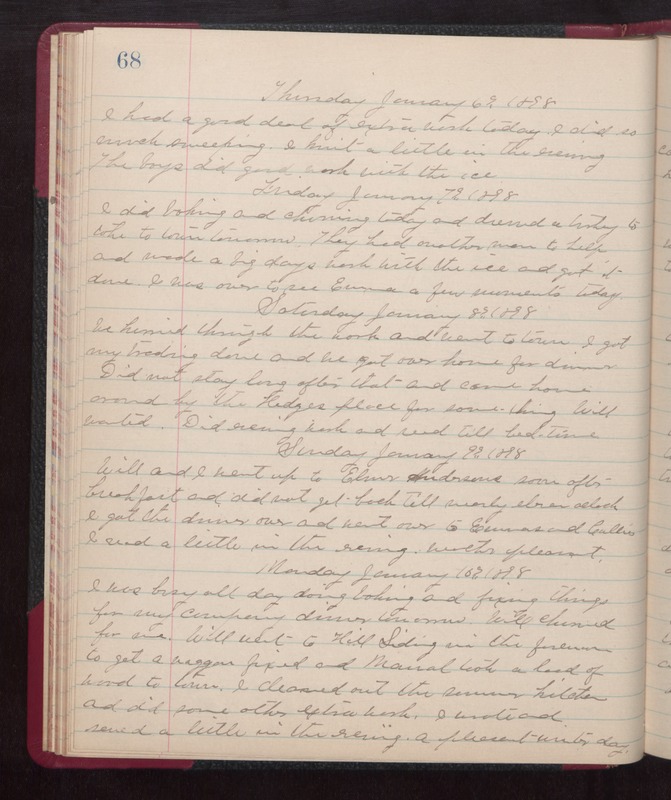 Monday January 10th 1898 I was busy all day doing baking and fixing things for my company dinner tomorrow. Will churned for me. Will went to Hill Siding in the forenoon to get a waggon fixed and Manuel took a load of wood to town. I cleaned out the summer kitchen and did some other extra work. I wrote and sewed a little in the evening. a pleasant wintry day.